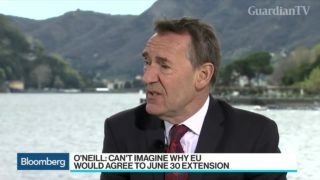 Chatham House Chair Jim O'Neill discusses Prime Minister Theresa May's request for a Brexit delay and the chances of a second referendum. He speaks with Bloomberg's Francine Lacqua and Tom Keene at the Ambrosetti Forum in Cernobbio, Italy, on "Bloomberg Surveillance." 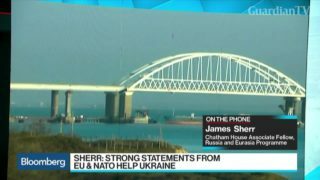 James Sherr, associate fellow, Russia and Eurasia programme at Chatham House, examines the fallout of Russia firing on Ukrainian warships and the renewal of tensions in the Kerch Strait, near Crimea.